Forget generic store bought toys, learn how to make custom stuffed animals that are sure to be talk of the toy box. From the fabric to eyeballs, this creature is completely customizable. This cute and easy sewing tutorial makes a great rainy day project that is sure to delight! Don't have time to run to the fabric store? This kids craft idea works great with scrap fabric and little odds and ends found in the junk drawer. The only limit is your imagination! Stuff for your stuffed! All you see here plus some imagination. Cut out a simple silhouette of an animal with your butcher paper. We made a simple rabbit, but a cat, dog, bear or even a octopus would be adorable. Draw out your animal in pencil, adjust your pattern if needed. Remember, none of us humans are perfect so if your pattern isn't exactly right, that's all part of the charm. First, Lay out your simple sewing silhouette on your fabric. We will be cutting both sides of the fabric at once, so stack your fabric right-sides facing inward. use chalk to transfer your pattern to your chosen fabric. Instead of tracing the outline of the pattern, instead we are scribbling the chalk onto the fabric. It's cool to get messy! Make an impression- transfer pattern to fabric using chalk. Cut out both pieces of fabric with your fabric scissors along the chalk outline. Our little friend is starting to take shape! Next, Cut along the chalk outline with scissors. Line up your two sides, again right side facing together inward, wrong sides facing out. We will be flipping this guy inside out soon, hold tight! Line up the two fabric sides to get ready to pin together. After the two sides are lined up, time to prepare them to be sewn together. Pin the two sides together at every curve and corner, this helps the fabric stay in place as we sew. Remember, we will be flipping this puppy (or rabbit in this case) inside out, so make sure you are sewing the side of fabric you do not want to be visible together. Pin fabric at corners, make sure the pretty side of the fabric is sandwiched together. With you chalk, mark an 4” gap on the leg. This is to mark the opening we will use to flip the animal inside out. Make your mark – leave an opening for fabric to be flipped inside out. 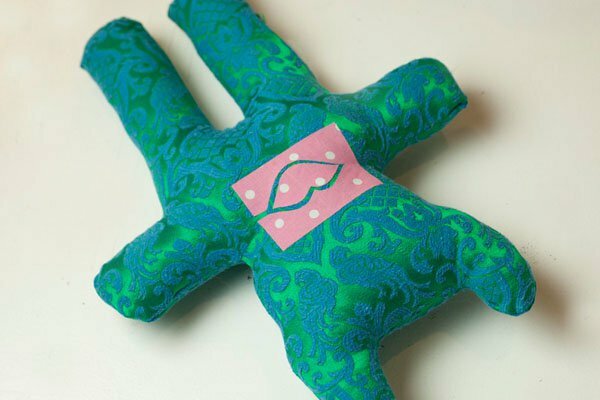 Use your sewing machine to sew the animal together, removing pins as needed. Remember to leave the 4” gap open. Secure the end of the seam with a back stitch or lock stitch to secure your sewing on both sides of the gap. We used a thread that almost perfectly matches our fabric, so it won't be noticeable, but contrasting thread would be cool too! Sew stuffed animal closed, except for the 4” hole we marked with chalk. Turn animal inside out starting by pushing one limb at a time. Push fabric through the 4” opening, may take some muscle, but we know you got this! Pull fabric through the opening on leg. Make sure all legs, arms and ears are accounted for! After you flip your stuffed animal inside out, it should look something like this. Now you little pal needs some personality. Lets give it some lip! Add adhesive backing to a spare piece of fabric, free hand (or draw out, if you so choose) a pair of perfectly kissable lips. Peel off adhesive, stick on where you think your new friend's mouth should go. Have some spare string or maybe a row of buttons? Anything can be a mouth, go through that junk drawer and up cycle! Make an easy iron on lips with adhesive paper. Make a face – place and prep for ironing. place your lips to the soon-to-be face of your plush pal. Once you have the right spot, strike while the iron's hot to seal permanently the lips shut! To prevent your lips from burning, move iron in small circles to distribute heat. Press down the pout with iron, move iron in small circles to avoid burning fabric. Take out your pillow, it's time to add some much needed fluffiness to our friend. With your scissors, cut a small opening on the corner of the pillow, to revel the fluff inside. This is what we will be using to stuff our animal. Start inserting generous amounts of fluff into starting at the top and working your way down to the feet. Don't be stingy with the fluff, pack the stuffing tight to insure a super soft and loveable animal. Cut pillow and pull out fluff, get ready to stuff your animal. We can't have our stuffing spilling out while we finish up our animal's face, so let's close up the hole in the seam. Fold over the fabric like you are hemming a pair of pants, then pin vertically along the opening. Once stuffed to the brim, fold fabric and pin for placement. Pinned and ready to be attached! Your plush so far, adorable! They say eyes are the window to the soul, so what does it mean if you have sparkle pom poms for eyes? While you ponder this, take out your pom poms. Add a generous amount of glue to the back of the pom poms and place them on your stuff animal. Press firmly down for 1-2 minutes. The eyes have it – use strong fabric glue to put peepers in place. Now that our face is made up, lets finish our friend off by hand sewing the seam hole shut. We used the blind stitch technique to create a perfectly seamless edge. For extra security, take a dot of glue to your finger and dab over the ed of your blind stitch. This will seal the deal! A blind stitch is the perfect solution to our holey problem. Final touch – a dab of glue holds all in place. Time to name your pal! Yes, this is an important step to your DIY! What personality does your creature have? We named our little one Snowflake, fitting name, no? Meet your fluffy and fab new friend! Enjoy your cute new pillow pal. Looking for more creative sewing projects? Don't look too far- we got a ton of projects right here, take a peek! OMG I love this! I want to make one right now! So many ideas and I did not know they were this easy!